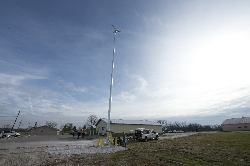 MACOMB, IL -- A small wind turbine was installed Dec. 6 at Western Illinois University to serve as a curriculum resource, while addressing sustainability goals of the University as part of the Illinois Institute for Rural Affairs' (IIRA) Illinois Wind for Schools project. Installation of the 70 foot, 2.4 kW (kilowatt) turbine and tower has been completed just west of Western's Harry Mussatto Golf Course. According to Fred Iutzi, IIRA renewable energy program manager, the turbine will serve as an on-site classroom for high school and junior high school students from around the state. 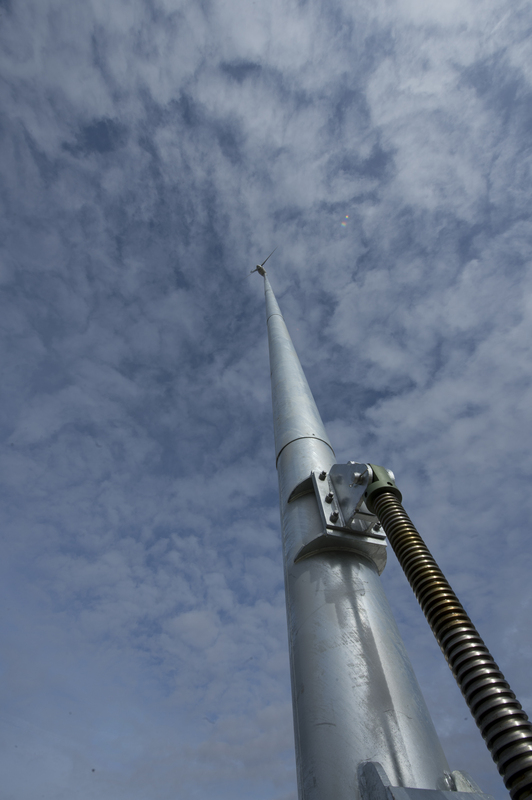 "This is a wonderful opportunity to showcase not only this renewable form of energy and to teach students new skills, but the turbine will also allow us the opportunity to showcase what the WIU campus has to offer," Iutzi said. The project is primarily funded by a $28,000 grant from the Illinois Department of Commerce and Economic Opportunity (DCEO), and is part of the Illinois Wind for Schools program. A joint effort of IIRA at WIU and the Center for Renewable Energy at Illinois State University, the Illinois Wind for Schools program helps Illinois high schools and middle schools integrate wind energy into their curricula, and provides service and learning opportunities for WIU faculty and students. 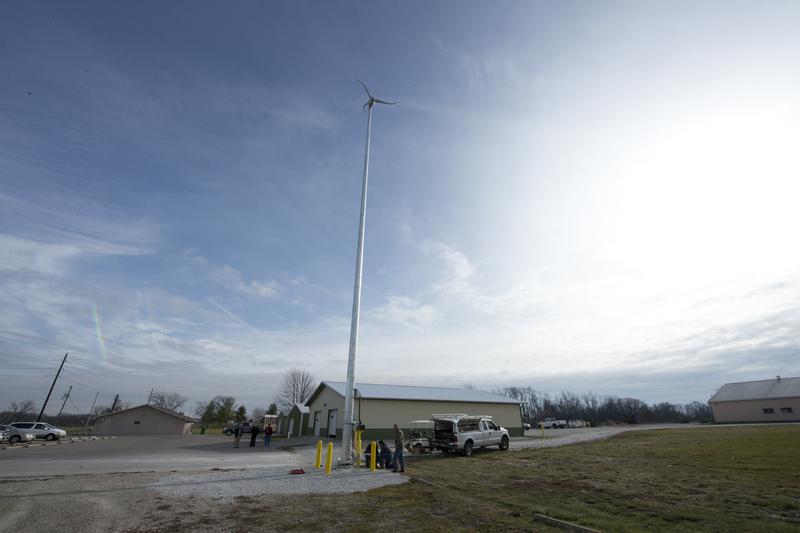 WIU Physical Plant Director Scott Coker noted that, in addition to its teaching impact, the wind turbine will offset a fraction of the WIU golf course's electrical load, approximately 200 kWh (kilowatt hours) per month. "The turbine, which was installed by Sky Yield Renewable Energy (of Kankakee), on the Macomb campus is another step in WIU's ongoing commitment to sustainability," Coker explained. "The golf course location was chosen after an IIRA-funded wind study determined it to have the greatest wind resource among possible sites on campus." In addition to the wind turbine on WIU's property, IIRA wind energy program staff collaborated with ISU to provide on-site workshops and demonstrations at high schools throughout the region. Recently, teachers at Astoria High School, which is one of six Illinois schools selected for the 2012-13 Wind for Schools program, learned to use KidWind model wind turbines, and were also presented with a weather station, customized lab activities and a wind energy curriculum. "Along with the curriculum and professional development components, we want to expose the students to the vast array of education and training programs offered throughout Illinois to help prepare them for renewable energy careers," Jolene Willis, IIRA wind energy program coordinator, added. "We hope to engage the private sector within each of these schools with a professional from the industry to explore career readiness and post-secondary education opportunities." According to the American Wind Energy Association, wind energy produced worldwide has enough power for six million homes (1.6 million in the U.S. alone), and the potential wind energy in America by 2020 is expected to produce enough power for 25 million homes each year. "The WIU turbine will be a great instructional and curriculum tool for WIU and for the general public," Willis said. "It sets the course for schools to incorporate this next generation of energy education into their classroom curriculum, as well as provides the opportunity for school districts to demonstrate sustainability by utilizing wind energy as a power source."